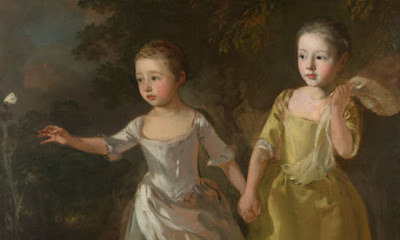 One of the few shopping expeditions which sticks in my mind was to Boston Spa in the early days after we came to Leeds, where we bought a carpet from a very nice woman who was amazingly capable of hoisting heavy rolls of the stuff about in spite of her slender size. She would have made an ace firefighter. Anyway, I hope she's enjoying a well-earned retirement now, reflecting back on all the wonderful but similar patterns she must have enjoyed examining on the eastern rugs and carpets in which she specialised. 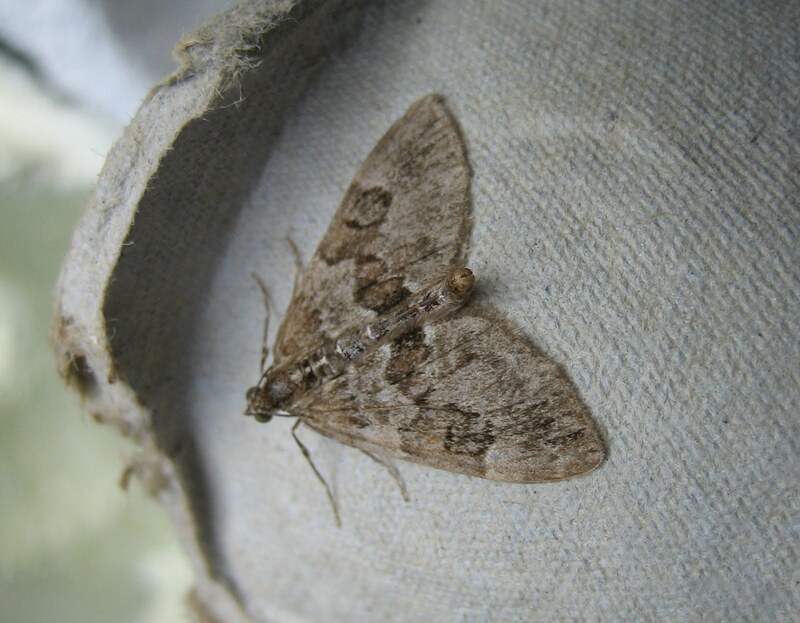 In just the same way, I am looking forward to having more time to sort out my carpets, the ones which are very abundant in the moth trap at the moment. ...and, above again, here is a Flame Carpet. That's what I think anyway. Immediately below is another and rather better Silver-ground. But what is the penultimate one? A third Silver-ground? If so, it illustrates the way that patterning varies within a species, adding to my current frustration but future joy when I will sit beside the fireside for as long as my eyesight permits, happily trying to decide such things. Just to press that point home, here in conclusion is another Flame Carpet, where the markings have begun to fade. Yet another source of Martin's Muddle. Update: David's given me an excellent hand again - see comments - and the last but one is a Garden Carpet. So that's four different Carpets in one night, and there were quite a few of them. I'm just heading out now, to turn on the light. Last night there was quite a lot of rain, fended off as usual by Mr and Mrs Robinson's amazingly simple but effective shield. But the prospects tonight are dry, if noticeably colder. One of those welcome arrivals this morning which make a change from the worthy but rather routine browns and greys: a Common Swift. It actually wasn't at all swift; extremely groggy but clearly awake, it spent just over five minutes staggering about before finally getting enough control over its wing muscles to fly away. Luckily it stopped for a rest every now and then, allowing me to take this couple of relatively unblurred photographs. Other pleasant visitors included a White Ermine and a large number of carpet moths of which more tomorrow. Penny will be proud of me this morning because I tiptoed back to the house carefully enough to find a pencil to illustrate the Lilliputian size of another arrival, this exquisite Foxglove Pug. A different pug, which I have yet to identify, found a different way of making the point - see below. Things are getting better, even if the weather is cooling, although that is happening more slowly than the Met Office originally led us to believe. I didn't trap last night cos of a busy day and general fatigue, but there's plenty to catch up on from the last, lovely, warm week. Here's a carpet moth - Spruce, I think - resting on the lamp flex in the jaunty, up-tails-all habit they have, above, and my old and frequently visiting favourite, the Spectacle moth, below. 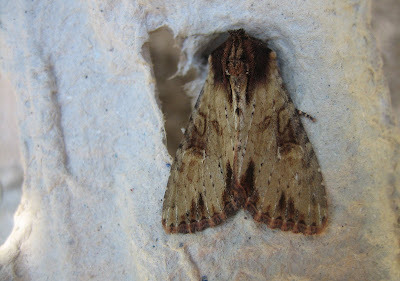 The many Scalloped Hazels which have come calling included this darker one. Just to add the identity confusion from which I suffer, many moth species vary greatly in colour and shade. The SH ranges from a pale, whiteish brown to a form which is so dark that it has its own third name - nigra or black - to add to the species' Linnaean title Odontopera bidentate. Something about two teeth there, my long-ago Latin tells me; presumably a reference to the twin points on the edge of the wing. Update: check out David Shenton's excellent, erudite addition to this in Comments. Note the Shuttle-shaped Dart lurking in the neighbouring eggbox cone. Sunshine means butterflies, and they have been lured out by the current blissful spell (which continues this morning in full, glorious force, judging by the view over my early morning teacup). 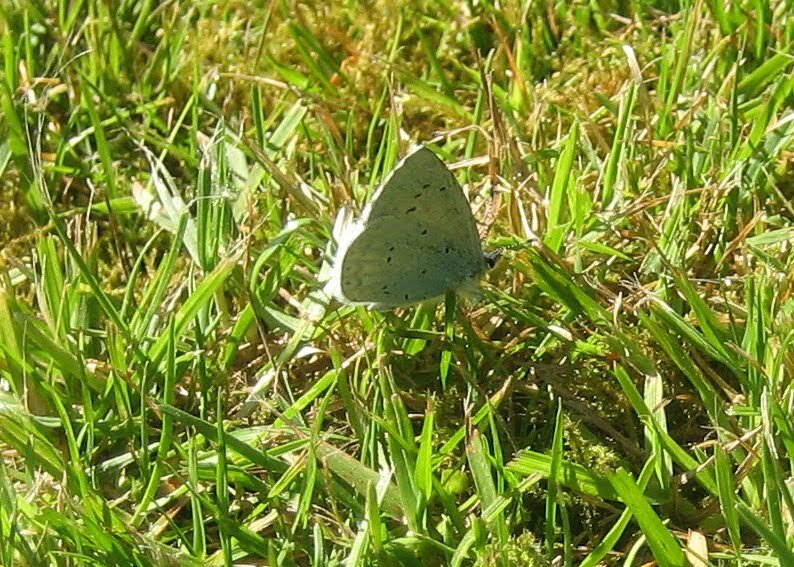 So far, we have had Peacocks, Small Tortoiseshells, Orange Tips, all three kinds of White and this little Holly Blue. It jinks about all day in the garden with a restlessness which is most frustrating for the ageing photographer. 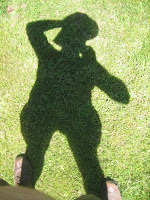 But then wouldn't you be nervy if a great big shadow like this kept looming over you? I'm sure my shorts aren't really that baggy. The camera can lie sometimes, or at least give an exaggerated impression. Just to start where we left off: here is an undoubted Shuttle-shaped Dart, obvious even to me, which arrived last night and illustrates the difference between itself and the one in the last picture of the previous post, whose identity David Shenton kindly confirmed. They even fold their wings in opposite ways, like the statues of Philomathes and Polymathes at Shrewsbury school - Wanting to Know and Know-all - which represent pupils at the start and end of their education. 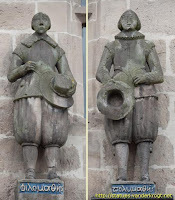 This appears to have been simply in learning the correct style of collar and haircut and how to carry your hat. Here's a fine arrival, albeit ineptly-named in the cloudless weather we are enjoying (and how we are enjoying it after soggy late Spring). 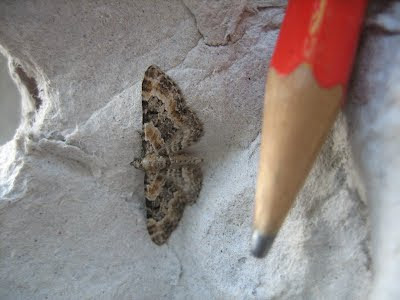 It is a Clouded-bordered Brindle, a fine-looking moth with its double-fanged pattern. Last year was the first time I saw one here, although they are not uncommon. Finally for today, a couple of Scalloped Hazels in the Land of Nod. 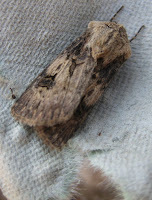 In spite of the much better conditions, moths are not over-abundant yet, but the SH is around in some strength. Morning has broken and another beautiful May day looks likely. I want to get out and enjoy it, but must first catalogue a few more moths from Thursday night. Yet more await me in the trap. I got up earlier before making our tea and started having a look; but after only one photo, the camera's battery fizzled out, so I returned gratefully to bed. This first micro is absolutely tiny. The blurry moth beyond it is a little pug, so I hope you can see that the micro is a speck - a millimetre long, if that. Next in ascending order comes this tortrix micro above. 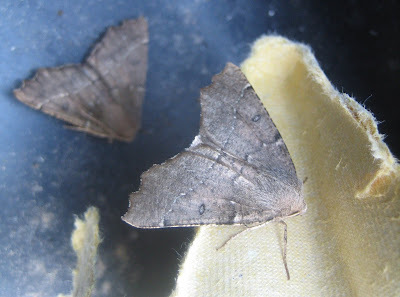 I await the forthcoming micro-moth Bible or a comment from one of my expert buddies to suss what these two are. This, however, is a Grey Pug, I am fairly sure. Although very much in the Jane Eyre governess class of moth, it has a modest beauty in its own way. And finally for now, I am frustrated by uncertainty over this larger moth, below. I was opting for Shuttle-shaped Dart because of the patterning, but the one moth which I have photographed so far this morning is definitely an SSD and it is a lot smaller. So I shall publish it for now as Anonymous and wait to see whether help comes from comments before my researches here resume. I hope the weather is lovely with you too. 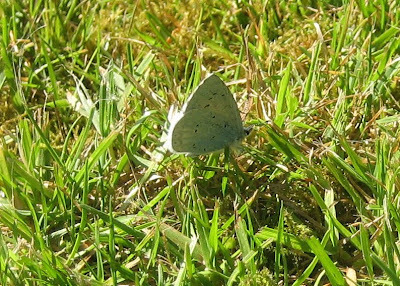 Speedy update (after only an hour or so...): See Comments for brilliantly rapid IDs of the two micros by David Shenton, and confirmation that the last moth is indeed a Shuttle-shaped Dart. Very many thanks, as ever. 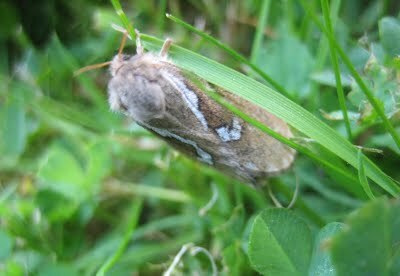 England is so lovely at the moment, and the moths are at last flooding in. The countryside is green after all the rain earlier in May and April, but basking in Mediterranean temperatures. Here to celebrate is a lovely green moth. The Green Carpet. What else could you call it? Its colour fades very quickly, so this one is freshly hatched. Yum! I'll sort out many more of the arrivals tomorrow (because it's getting very late and I have been down to London today and am sleepy). A couple of handsome moths this morning, especially the White Ermine which always reminds me of the House of Lords. It has a habit of snoozing in curtains and was thus one of the first attractive moths I saw as a child, as opposed to grey and brown things jinking about in the dusk. This is still the case. We went to see some cousins a year or two back, and their teenage son came downstairs to report an interesting moth. It was a White Ermine on a dark blue curtain, in similar excellent and newly-hatched condition to this one. The second moth is, I am pretty sure, a Lychnis, although there is a very similar one called the Campion and a third with the appealing name of Pod Lover. All three actually love pods. As caterpillars, they live comfortably in the seed pods of campion flowers, munching away at their surroundings until either they are too big or there are no surroundings left. Then they pupate and in due course turn into this lovely moth. I didn't think that I would ever say nice things about a pug moth, but there we are. 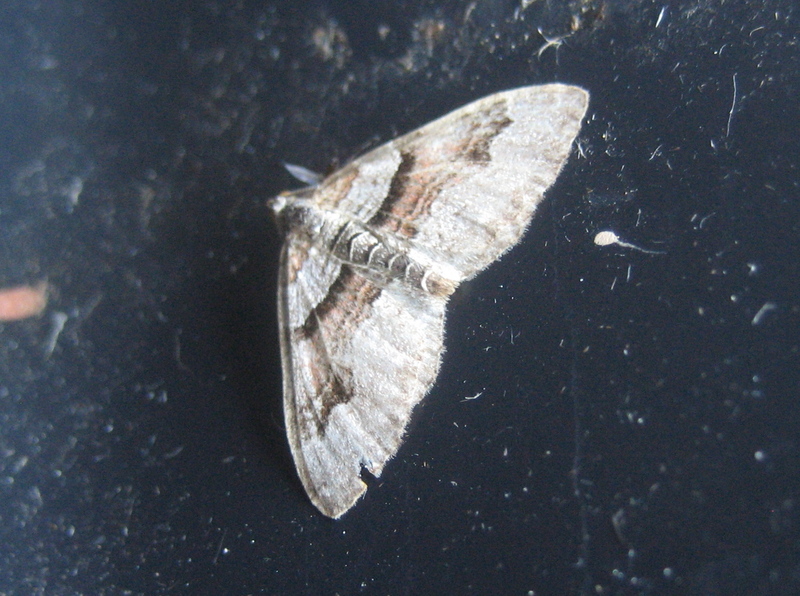 This one is lovely, even though - I think - it's only a common Wormwood Pug. It didn't look much when I took the picture, but the camera has brought out the subtlety and beauty of the colour and patterning. I regard the tribe with new respect. More moths are arriving now with the warmer weather and the year's record temperature yesterday of almost 25C. Above are a couple of nice little micros, my new enthusiasm, and below a pair of carpets - Spruce and Red-green? - and a rustic of some kind; once more I have to add 'I think'. I shall try to find time to be more definite shortly. 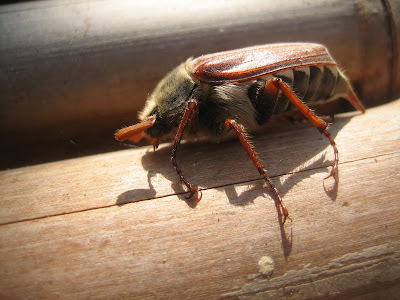 Welcome to the first maybug of May; two of them actually, each as daft as the other as they trundled ponderously around the hills and valleys of a Happy Eggs half-dozen box. Aren't they extraordinary? So well-armoured and so oddly patterned. These are the creatures proverbially supposed to live only for one day, a legend often applied indiscriminately to insects, including moths. Most get well beyond that, although it is mildly surprising that they do. They are clumsiness incarnate, with a flight like a demented USAF drone. Still the chill; but we had a moment of real warmth yesterday afternoon and the forecast is for proper May weather by Wednesday. About time too. As if to bear this out, the first newcomer to the trap for quite a while arrived last night. It's a Scalloped Hazel, not uncommon and a regular visitor in past year; but a sight for sore eyes, over-used to eggboxes empty apart from a few Quakers, Drabs and Pugs. Talking of the last, they sent a representative too, perched on the outer frame of the trap and very small by comparison with the Scalloped Hazel. I sense that good things are on the way. Sap rising, buds bursting, moths coming... All that sort of thing. Update: the expert Ben Sale, to who I am ever thankful, identifies this as a Dwarf Pug which, as he says, is far from the smallest of the tribe, in spite of its name. See comments. Yesterday was my birthday, hooray, so moths have had to take a back seat. From the early hours, Penny conducted me through a series of excitements to mark the day. So the trap has remained unplugged and silent; and anyway, for the last two nights, it has rained. Butterflies have had a good role in the happy proceedings; both Penny and Granny Dilys chose them for my presents' wrapping paper; see above and below. Assorted other parts of the jollifications have been butterfly or moth-related too, including a lovely pin-badge from one of my nieces in Scotland. An entire blog could be written on the role of butterflies in human imagery right back to the ancient Greeks' use of the word psyche to mean both 'butterfly' and 'the soul'. On that score, you might be interested in the example currently at Newcastle's Laing art gallery and described here in the Guardian Northerner by Alan Sykes: Thomas Gainsborough's painting of his daughters in which their older sister Mary who died young is represented by a butterfly. Here it is. Back on earth, we had a lovely birthday walk from Beningborough to Newton-on-Ouse and back, up the riverbank (famed sanctuary of the Tansy beetle) and back through the National Trust park. Here are some of the seas of bluebells we wandered past en route. Have you ever been to England's smallest county, Rutland? You may have done without noticing, because if you're bowling along the A1 Great North Road, it flashes by. It used to be the piece in our Counties of Great Britain jigsaw which always got lost, along with the smaller part of Flint. Anyway, it has a very good motto: Multum in parvo, or 'A lot in a little'. That applies to insects too, and my initial thought that there were none in the trap this morning, after rain, cold and a power cut seven minutes before the end of The Apprentice, was quite wrong. A closer look revealed these two residents, the top one doing its own version of a handstand and the other, I fear, an ex-insect, dead. It looks in repose, doesn't it, like one of those effigies on a mediaeval church tomb? What they are, must await the attentions of a passing dipterist or fly expert, but even in my wobbly hands the wonders of digital macro reveal how complex and interesting such minutiae are. I still pine for moths, mind. It can't be long before they, and the warmer weather, return. I was once the only person on a package holiday to Iceland and I guess that this wasp must be feeling rather the same way. It had the trap to itself after another chilly night. One of the only headlines this morning to vie in popularity with all the stuff about Rebekah Brooks is on the snow which has fallen in the northern Pennines. Pity the darling buds of May. Wasps are very beautifully patterned. They got to the hazchem/health warning colour combination of yellow and black first. They suffer terribly for their reputation as stingers, but they will never attack a human being deliberately and for all but those with medical conditions, the sting is no big deal anyway. They also build the most beautiful nests from which architects have taken inspiration and even learned technical lessons. I saw this one politely and safely on its way. This is the poorest May for moths in my five years of trapping, and I think it's down to the cold. We had quite an abundance of arrivals in April and even March when it was by contrast unseasonably warm. This morning, the nest of eggboxes was empty and there were only these two ittle pug moths on the plastic canopy. 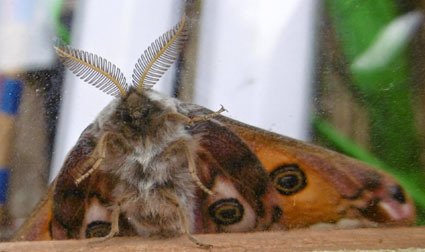 This contrasts with mid-May last year when such glories as a Pale Tussock and a pair of Elephant Hawks paid a visit, the latter on my birthday which as I remind everyone, is on 18 May. In 2010, however, I note that I criticised the choice of 15 May as National Moth Night on the grounds that it was so cold that the trap's 'arrivals lounge has been almost as empty as a British airport's during the Icelandic volcano's ash-spew' - you remember, the one which grounded all the flights. I shall go further back into my records shortly, but must now take Penny her morning tea (and mine). Update: OK, now I've wandered round my archive, and I see that in 2009 I didn't run the trap at all between 26 April and 23 May because for quite a chunk of that time we were in California and New Mexico. And in 2008, my first year with the moth trap, I didn't get going until 11 June. So my vague feeling that May used to be much mothier is entirely the product of my imagination. This is a good example of our tendency to think that everything was better in the good old days. By and large, it was not. Don't expect wonders in the immediate future, meanwhile, because the forecast is of cold nights, possibly including frost. No trapping last night so no moths. 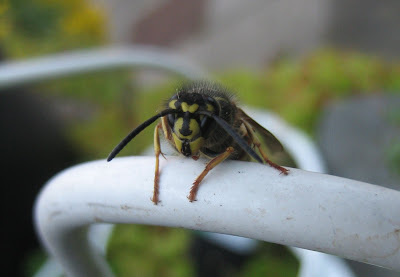 Instead, one of my famous photographs of hovering bee-type things. This can be fun for all the family, provided you have (a) a digital camera with macro facility and (b) a sunny day. Given (b), take (a) outside, turn on to macro mode and hold in front of you. Within seconds a hovering-type insect will come and examine what it presumably takes to be an exciting new flower. Point the camera generally in its direction and take as many pictures as you can (impossibly costly in the old film days). At least one of them is likely to be passable, as above.